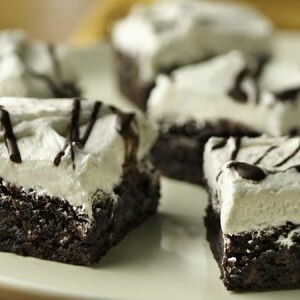 Enjoy these classic whoopie pie brownies made using Betty Crocker® Gluten Free brownie mix with marshmallow crème topping – a perfect baked dessert. In medium bowl, stir brownie mix, 1/4 cup butter and the eggs until well blended (batter will be thick). Spread batter in pan. Bake 8-inch pan 28 to 31 minutes, 9-inch pan 26 to 30 minutes, or until toothpick inserted 2 inches from side of pan comes out almost clean. Cool completely in pan on cooling rack, about 1 hour. In medium bowl, beat powdered sugar and 1/2 cup butter with electric mixer on medium speed until light and fluffy. Beat in marshmallow creme and vanilla on low speed until combined. Spread over brownies. In small resealable freezer plastic bag, place chocolate chips; seal bag. Microwave on High 30 to 60 seconds, kneading bag every 15 seconds, until chocolate is melted and smooth. Cut tiny corner off bag; squeeze bag to drizzle chocolate over brownies. Let stand 30 minutes or until chocolate is set. Cut into 4 rows by 4 rows. Store loosely covered at room temperature. Whoopie pies originated in New England as mound-shaped cakes filled with a marshmallow-cream filling.